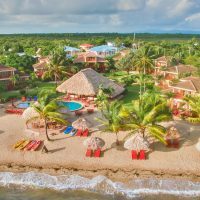 This boutique hotel on the beach in Belize City has just 16 rooms but all of the amenities and services of a much larger resort. Children of all ages are welcomed in room with their parents for another $10 per night and rooms are spacious enough to add a crib or roll-away without becoming too crowded. Kids will love the fresh baked cookies and bananas always available in the lobby. While there is no children’s program as such, The Great House coordinates guided tours for families with a variety of interests. 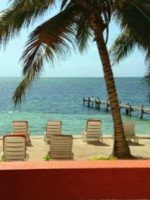 From cave tubing and snorkeling to river rafting and hikes through the rain forest, the staff works to provide exactly what meets the interests of your family. Once a private home, The Great House is a block from the beach and an easy walk into downtown. The Smoky Mermaid Restaurant on property is one of the most popular in the city and open to the public even if you don’t choose to stay here. My lady and I very much enjoyed our one night here. We liked climbing the staircase, but I was still amazed at the porter who appeared and hauled *both* of our heavy suitcases up to our landing all at once by himself. He disappeared before we could tip him. As for amenities, it helps that the Radisson Fort George is right next and across the street. The lady at the front desk was friendly and very knowledgeable about the area and shared good information. The room was woody and reeked of character, though perhaps its elegance was greater in the past. Friendly staff, clean room, quiet and good location! We enjoyed evenings on the wrap around verandah. Great breakfast selection next door at The Petit Cafe as the restaurant was under renovations. We very much enjoyed our stay here!